Rangers manager Walter Smith admits his decision to hand Allan McGregor the goalkeeping gloves ahead of Neil Alexander against Falkirk was "unfair". McGregor was dropped last season along with Barry Ferguson for misbehaviour while on Scotland duty. "In many ways it was a little bit unfair on Neil Alexander because of the fact that he has come in and played exceptionally well for us," said Smith. "It was a managerial decision, it was an awkward one." 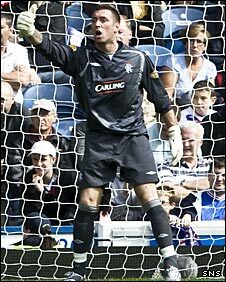 Alexander was in goal as Rangers clinched the Scottish Premier League title and the Scottish Cup while McGregor's Ibrox future was in doubt following the "boozegate" affair that ended his international career. Former captain Ferguson was sold to Birmingham during the summer, but McGregor has remained at the club and won his place back as Rangers kicked off the season with a 4-1 win over the Bairns. "Both our goalkeepers know that, if they are playing, they have to show good levels of form if they are going to stay in the goals," said Smith. "We are fortunate to have two good goalkeepers at the present moment. "When I got Neil Alexander, I got him to come in as back-up to Allan McGregor and I think he has now moved up the scale in terms of that. "I would have no hesitation in putting him in the goal, therefore we have a level of competition for that position." Smith did not expect Alexander, who had accepted the decision to leave him on the bench for Scotland in midweek with great dignity, to be happy about the decision. "Neil will take it badly and, if I was him, I would take it badly as well," said Smith. "There's not a lot any of us can do to alleviate that aspect of it. "But he has got himself into a position where he knows if Allan doesn't reach the required level then we have got absolutely no hesitation in putting him in." Smith picked out Kenny Miller, who scored twice, and fellow striker Seven Naismith, who was also on the scoresheet, for praise following the win over Falkirk.